DiBella Law Offices, P.C. would like to congratulate all of our scholarship winners. 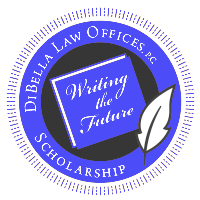 We launched our Writing The Future Scholarship in 2017 to assist deserving college-bound students in paying for secondary educational expenses. We hope that by offering this money, we are helping not only one student, but an entire community that will reap the benefits of that student's drive for success. DiBella Law Offices, P.C. would like to thank all who applied. Please check our blog and Facebook page for announcements and other scholarship opportunities. 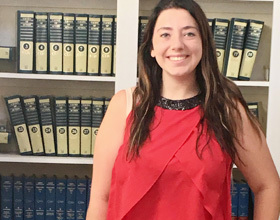 "Once I graduate, I hope to apply the knowledge that I learned as psychology major and help those with mental illnesses in Somalia." Iam a Psychology major as well a Global Social Entrepreneurship minor at Northeastern University. My dream is to use the knowledge I gained from my academics to build a non-profit organization that helps people with mental illnesses. I aim to help end the stigmatization of mental illness in developing nations as well as provide them with access to mental health treatments. I was born in Somalia, a war torn nation riddled with disease, famine, and violence. My mother left everything she knew and loved when the civil war broke out in Somalia. She worked tirelessly day and night so that my sister and I could have successful lives. I am so thankful for my mother, I could not be where I am without her. She taught me to always stand strong, to face all my challenges, and most importantly to succeed. I always knew that I wanted to return back home and rebuild my country in any way that I could. Hearing my mother talk about our home, a home that I did not know for very long, saddens me. It was once a great nation filled with beauty and culture but now it is a shell of what it once was. Once I graduate, I hope to apply the knowledge that I learned as psychology major and help those with mental illnesses in Somalia. Many of the citizens suffer from depression and PTSD due to the wars that ravaged the land and they need proper help and treatment. "I want to help treat these real diseases so that people with mental illnesses can find their place in the world." In many developing countries there is an appalling stigma towards people with mental illness. Many people view them as incapable and are thought of as inferior. There are no proper treatments for the mentally ill, they are usually shunned and are never allowed to play an active role in society. More often than not, people view mental illness as embarrassing, dangerous, or even possession by supernatural forces. This leaves the mentally ill in a position where they are unable to obtain the help that they so desperately need. Some even refuse to acknowledge that they need help because they do not want to be looked down upon. I am glad that I was able to come here because I had so many opportunities around me that helped me discover my passion. 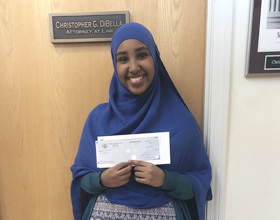 My goal is to help spread mental health awareness in the Somali community and to do that I became the treasurer of the Northeastern's Somali Student Association (SSA). I help plan events that revolve around mental care and how students should take care of their mental health by learning to manage their workload. Soon the SSA plans on having events that discuss the stigmatization of mental illnesses, especially in the diaspora. I am also currently working with the president of SSA to create a play discussing the negative views the community has about therapy and seeking mental help. It will address why many Somali people do not value therapy and see psychology as a profession for the truly insane. Times, however, are slowly changing and I have seen an increase interest in the Somali community regarding mental health awareness. I attended many events and participated in a great deal of the programming, and even plan to run some events myself. This spring in fact, the Somali Student Association is planning on coordinating an event that will address mental health and how that pertains to the civil war in Somalia as well as the diaspora. Although, one thing I noticed was that the events were mainly attended by the youth. The older generation believes that psychology will not help people but instead would hurt them. The younger generation that grew up in more developed nations, has a harder time conveying their viewpoint due to the different cultures each generation was raised in. "Change is not something to be feared. It opens doors to new possibilities." The older generation is most likely terrified of the idea of addressing the mental health issues in the community and the change that it will bring with it. To me change opens up a door to new possibilities. Standing outside the door people only see darkness and that envelops them with fear. They do not know what to expect in the darkness and therefore fear what it could bring, but once they step through the door they will be engulfed in light and wonder. The world is constantly changing and people should adapt to these changes in order to progress; yet some are unable to change due to the fear of what it may bring. Change is not something to be feared. It opens doors to new possibilities. In order to help people understand mental illness, I plan on starting a nonprofit organization, using psychological treatment to help people with mental illnesses and to end the stigma surrounding it. In fact, I am currently with a nonprofit organization, BEST Hospitality Training Center, as a career coach. BEST helps low income individuals, immigrants, and African-American people, who are either unemployed or have a job that does not provide them with any benefits, find a union job within the hotel industry. As a career coach I help prepare the students for interview questions as well as build up their confidence. I help them find their inner strength and the motivation that they need to fuel to build themselves a successful future. Moreover, these students are not teenagers, they are adults with children and family, some of the students are even 70 years old. All these students want is a better quality of life and BEST insures that they will find the proper support that they need in order to rebuild their lives. Working with BEST Hospitality Training center will be beneficial in aiding me to making my own non-profit organization that deals with mental health. I want to have make a social impact that will help people find the motivation that they need to better their own life. I intend to educate the public on what mental illness truly is, it is not evil but an illness and like every illness it needs treatment and support. I do not wish for people to be isolated and shunned for something that they have no control over. Instead I want to help treat these real diseases so that people with mental illnesses can find their place in the world. "Attending college would open so many doors for me and allow me the chance to put my passion into a career helping people in need." My name is Alexis Sorensen and I will be graduating from Billerica Memorial this year. Whether it is at home or at school, I put one hundred percent of my effort into all I do. At home, I have many household responsibilities, one of which includes taking care of my disabled grandfather. I administer insulin to him daily and make him meals when I get home from school. In addition, I work approximately twenty hours a week at Shaw's where I have been promoted twice in the matter of a year from cashier to desk clerk to customer service representative. My manager attributed my promotions to my excellent people skills and that means a lot to me. I am a very social person and in that sense I am a lot like my mother. Even though I do work a lot, I still remain engaged in both the school community and my local community. "I take joy in knowing that my presence can have a positive impact on someone." At school, I have maintained a cumulative GPA of 3.9 throughout my four years in all honors and advanced placement classes. I am a part of the National Honor Society, French honor society, literary magazine, French club, peer leaders, and writing center. In the community, I volunteer at the Billerica Public Library, the local food pantry, and at other events. In my spare time, I enjoy going for walks, shopping, and writing. I have had a lot of stress-inducing things happen to me over the course of my life and writing has always been a stress reliever for me. I come from a pretty large family; more specifically, a small intermediate family and a large extended family. We are all very close. My little brother is my best friend. He is a freshman in high school and I spend a lot of time with him when I am not at school or work. He makes me a better person and I have learned a lot about enjoying the little things in life from him. In order for you to understand my future goals, I think it is extremely important that you understand what caused me to possess these goals. I have always been a person who loves to help others. I take joy in knowing that my presence can have a positive impact on someone, especially someone I care about. I think I got this quality of mine from my mother. She always goes out of her way to not only help members of our large family, but furthermore to help those in our community. She went from being the helper to the person who needed help when she was diagnosed with Stage 2 breast cancer in January of 2011. My mom started going to chemotherapy every week and I would go with her every chance I got. It tore me apart seeing her like this because during these months, she was not my mom. My mom is energetic and lively; and while on chemo, my mom was the exact opposite. So, I took her place as the foundation of our family for a while. I made dinner every night; I helped take care of my disabled grandfather and lifted some of the weight off her shoulders. The most important role I took on was I became her ears. At appointments with her oncologist, I took notes. I knew every medication she was on, every side effect she might experience, and when every appointment was. I was twelve. Regardless, at this age I was able to put aside my emotions toward my mother being sick and focus on her recovery and how medicine would play a role in this. "I put one hundred percent of my effort into all I do." My mother went into remission approximately a year later and I wrote her oncologist a two-page letter thanking her for saving my mother's life. At that point in my life, I knew I was intrigued by science, but I had no idea what career I would choose to pursue. However, this all changed a few years ago when I went to my mom's yearly checkup with her and saw patients suffering with the same cancer that tried to take my mom away from me and it really bothered me. I took these emotions, along with my gratitude towards my mom's oncologist, and I realized then and there that this is what I want to do for the rest of my life. I want to be an oncologist. I intend on attending the University of Massachusetts Amherst on the premed track with a major in cellular biology, and going into medical school after that so I too can become an oncologist. Attending college would open so many doors for me and allow me the chance to put my passion into a career helping people in need. I recognize the goal I have is not easily achieved and there will be many obstacles and challenges along the way that will try to impede my success of this dream of mine, but my experience and that of my mother will be pushing me through the many years of schooling that lie ahead of me. I also recognize that all this schooling will be a financial difficulty for my family and me to cover on our own and that is why I am asking for your help. I am willing to put in 110% percent of my effort and be completely devoted to pursuing this dream of mine. I work with professors on research opportunities outside of the classroom and will do whatever I can do to better myself if I am awarded the money to allow me to do so. I accept this task because it will all be worthwhile when I am the one that saves a little girl's mom and gives her the chance to see her kid graduate, or gives another chance of life to people who thought that they had to sit back and accept the harsh cards that life had dealt for them. I'm not saying I want to be God and decide who lives and who dies, but I want to do all that is in my power to give someone the chance at the life they deserve, a cancer-free life.